Enhancing the shape of one’s body can be done utilizing various means. I have done several waist sculpting methods in the past and I discovered that what worked best is waist training. Now, I am ready to show you what is so effective about this particular method. Since I have felt and experienced the benefits of waist training, I encourage you to give this fitness solution a try. Waist trainers like corsets and binders can be incorporated to your daily clothing. You don’t have to alter your lifestyle immensely for this training to work. All you need to do is to wear the waist trainers on a consistent basis to achieve the results you are aiming for. As part of our training, we wore the waist trainers regularly for a couple of months and we have observed significant changes to our bodies. Now, it is much more convenient for us to wear corsets everyday and after noticing that they feel looser, we adjust or use a smaller sized one. We really love this waist training method. It not only sculpts the figure but it also gives us a new perspective about our bodies. We have a much more confident aura and as women, we feel more empowered since corsets also improve our postures. Are you wondering about the plethora of benefits you can get with waist training? Well, wonder no more because we will show you what you have been missing. Studies show that waist training, although it was not formally called that in the past, has been practiced many decades ago. 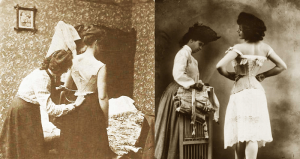 Women from the past centuries have been wearing corsets in Europe and in America. They wear them underneath extravagant and beautiful ball skirts and dresses. It is no surprise to learn now how curvaceous those women in history were. They had the help of waist shapers even before. Gives the appearance of a smaller waist instantly. Of course, it would take a longer time to make the change permanent but corsets when worn can decrease the size of your midsection by 3 inches immediately after wearing them. Sculpts your back. Corsets make your back appear flatter and more slender. Induce perspiration that enables you to lose weight. Wearing waist trainers is a great way to make your workout more effective. When it produces heat in your body, you become more likely to sweat the excess fat away. Traditional exercises are great for your body and a good diet is helpful but waist training is one of the methods that can provide instant results. It is a short-term remedy that can turn into an effective long-term method for weight loss if you are just wise about it. Coupled with a healthy lifestyle, we think wearing corsets can dramatically change your life for the better. The physical benefits are good and the psychological ones are even more impressive to us. When you wear corsets, you gain a huge amount of confidence which in turn motivates you to exercise and diet more in order to maintain your figure. These factors can work hand in hand in giving you a body that looks phenomenal as well as a heart and mind that embraces a positive perspective on life. A woman with excellent posture is the envy of her fellow women. She looks more ladylike when her back is upright and she possesses a steady gaze. With waist training, you can reduce your slouching and stand and sit straight. You will have more poise if you tuck your stomach in and erect your shoulders. Slouching women are a turn off but when you have great posture, you become more attractive. Not to mention, healthier and much less prone to back aches in the future. Waist training at an early age can be beneficial to you in the future. If you have trained your body to become straight and slim, you will live a healthier and much more energetic life as you age. Wearing waist shapers when you exercise makes it easier for you to avoid injury and unnecessary back pains. Men have been wearing waist trainers when they work out for decades. Professional athletes wear them when they train and practice so there is no reason why you should not give it a try. One of the great points of waist training is how it increases your motivation to have a better and healthier body. Fad diets don’t work because they give you false hope. With waist training, as soon as you see the difference in your body after wearing a corset, you feel more inclined to do the work and wear your waist trainers more consistently. Great results make you more positive as a person. There’s no denying that fact. Since waist trainers provide instant results, you are more likely to continue wearing them and perhaps, incorporate proper exercise and diet for a long term effect. We think that everyone who has tried waist training will agree that it’s not just your physical body that will feel the transformation but also your state of mind. If you want to inject more confidence in yourself, you can wear corsets underneath your work clothes or evening gowns. You will immediately feel empowered and ready to conquer the world. If you’re out shopping, you will notice that the clothes you try on will look more elegant or attractive. These situations boost your confidence and make you feel like a brand new person. Some people believe in wonder drugs or fad diets to achieve a healthier lifestyle. You don’t have to deceive yourself by buying expensive pills or eating poorly. Our advice is to try wearing waist trainers for a month for a few hours and see the difference that makes. When you wear corsets, you need less time to prepare in the morning because most of your clothes will fit in your body. You don’t have to change clothes multiple times and feel depressed because you have nothing good to wear. Waist training will remove that dilemma and make you happier and in the long run, healthier and more positive. For me personally, the reason why I choose waist training is to get my pre-baby body back. Well, if you are like me, please read Get Your Pre-baby Body Back.